Screen composed of four doors in mm. 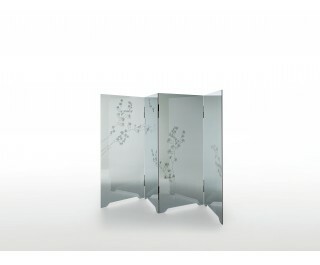 8 thick tempered reflective smoked glass, decorated with images of nature. The low relief decoration, achieved through a special glass engraving technique, gives depth and three-dimensionality to the featured images. The hinges, glued to the glass, are in black chromium-plated metal.